Lindt Lemon is the newest chocolate bar in Lindt’s Excellence line-up, billed as “dark with citrus pieces and almond slivers”. I received a free sample from Lindt for review. Alas, the overnight shipping, cold pack, and insulated bag couldn’t stand up to the North Carolina heat, so my sample arrived melted and not as photogenic as it could be. Fortunately, it still tasted awesome! 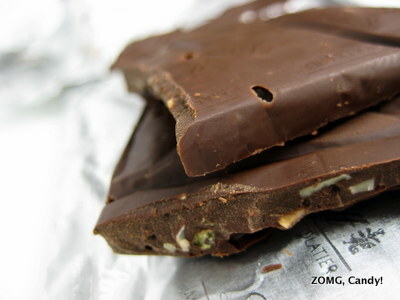 The dark chocolate had a thick, matte melt that was broken up with a slight crunch from the thin almond slivers. I also came across the occasional piece of lemon zest covered in a grainy sugar. At first, the bar was sweet. Then, a bright, effervescent lemon zestiness came through, tempered by nuttiness from the almond slivers. It finished with a cool, citrus sweetness. This bar was incredibly well balanced in both flavor and texture. I loved how the bright fruitiness played off the dark chocolate, resulting in a refreshing treat. An OM.